You’re probably reading this because you’re tired of seeing your email signature images being added as attachments in your emails. Believe it or not, this is a very common problem that many people face. But don’t worry, there are ways to fix this all too common problem. Before we get into the technical details, it’s important to know exactly why this problem happens so you can understand it better. Why do email signature images get converted to attachments? For as long as emails have been around, there have been 3 different email messaging formats: HTML, Rich Text, and Plain Text. When you use a HTML email signature (one that includes images such as logos or profile pictures), you must use the HTML or Rich Text messaging format when sending out emails. If you don’t, the pictures in your HTML email signature get added as attachments to your email. This happens because the plain text messaging format doesn’t support images, so instead of completely removing the images from your email, they are simply added as attachments. This setting is under File > Options > Mail > Compose Messages > From the “Compose messages in this format” section, choose HTML. This setting is under Tools > Options > Mail Format > From the “Compose messages in this format” section, choose HTML. With Apple Mail, when Rich Text is selected, it is automatically converted to HTML when sending emails. 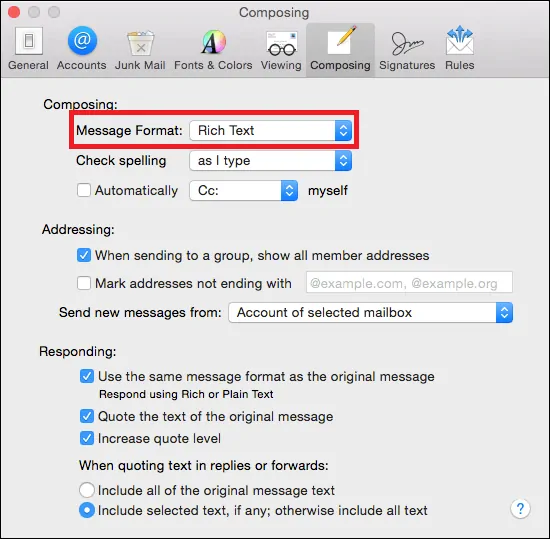 This setting is under Mail > Preferences > Composing Tab > From the “Message Format” section, choose Rich Text. What about when someone sends you an email in plain text / rich text format? In an ideal world, everyone will have their email clients set to compose new messages in HTML format, but unfortunately that is not the case. 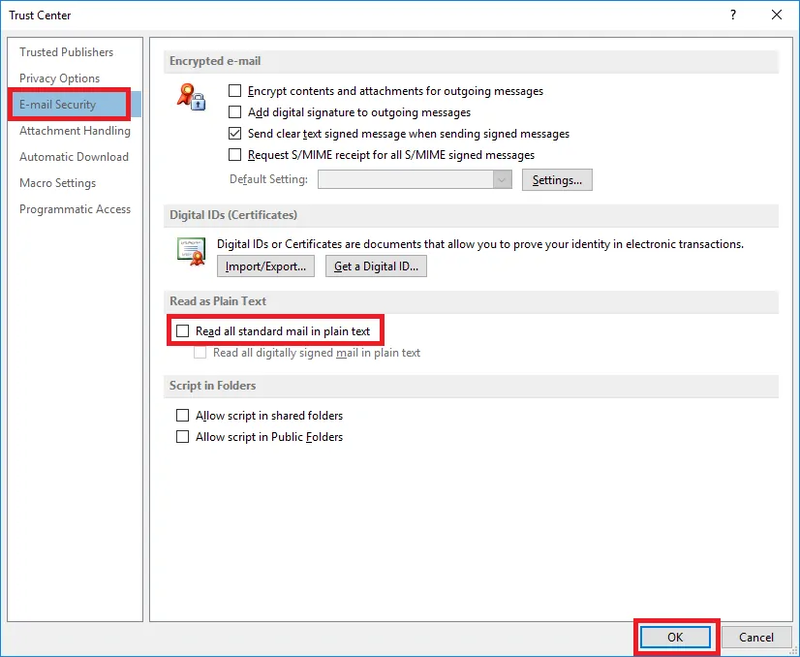 If you receive an email in plain text / rich text format, you can easily change the message format, however it is a manual action you have to do for each message. Open the message in a new window (double click on the message) then click on Reply, Reply All or Forward. At the top, click on the Format Text tab, select HTML. 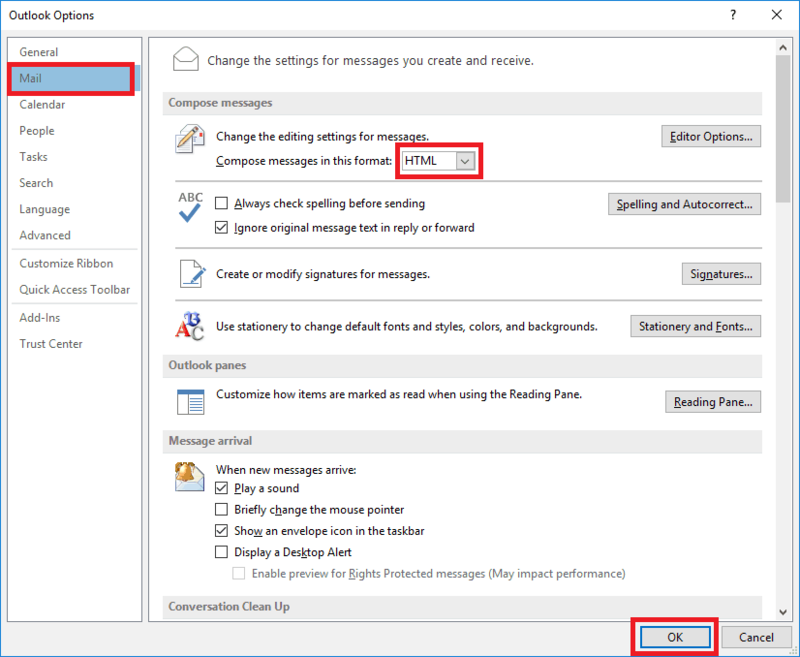 Outlook also has an option where it converts all incoming email messages into plain text format. If all your incoming emails are being converted to plain text, check the setting below and make sure it is not ticked. This setting is under File > Options > Trust Center > Trust Center Settings… > Email Security > Read as Plain Text > Read all standard mail in plain text. When you compose a new email in HTML format, the email doesn’t always stay in that format throughout the email chain. The email format can be changed by anyone who replies to that email. For example, take a look at this example email trail to see how it can get converted between formats. Debbie: Uses HTML email messaging format. Harry: Uses Rich Text messaging format. Tom: Uses Plain Text messaging format. Debbie sends an email to Harry – Email is converted from HTML to Rich Text when it reaches Harry’s inbox. Harry forwards that email to Tom – Email is converted from Rich Text to Plain Text when it reaches Tom’s inbox. Tom forwards that email to Debbie – Email is delivered to Debbie’s mailbox as Plain Text. But hang on, why is the email delivered to Debbie’s mailbox as Plain Text? Wouldnt it be converted to HTML format since Debbie’s email client uses HTML messaging format? The answer is no. Email clients will automatically downgrade messaging formats, but in order to upgrade, you need to do it manually. So, an email will freely convert from HTML > Rich Text > Plain Text, but once it’s in plain text format, someone will need to manually change it back to Rich Text or HTML by using the above steps. At times, your Microsoft Exchange server can automatically convert all outgoing messages into plain text, and if that is the case, then you need to get in contact with your network administrator to remedy this problem. However. 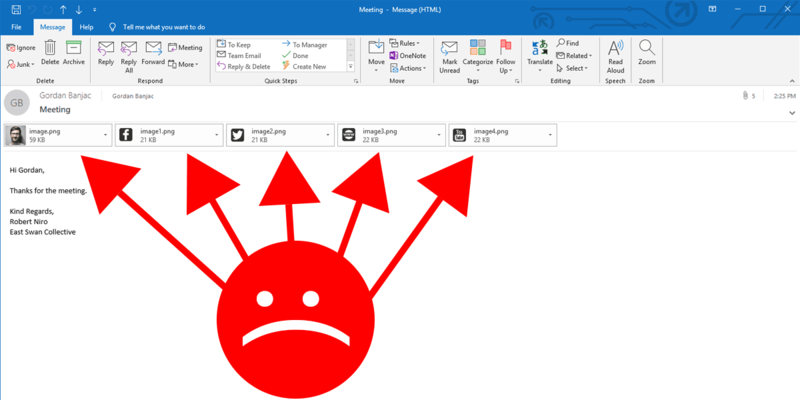 this doesn’t normally happen, as the default Microsoft Exchange behavior is to send all messages in the format that the email client dictates. 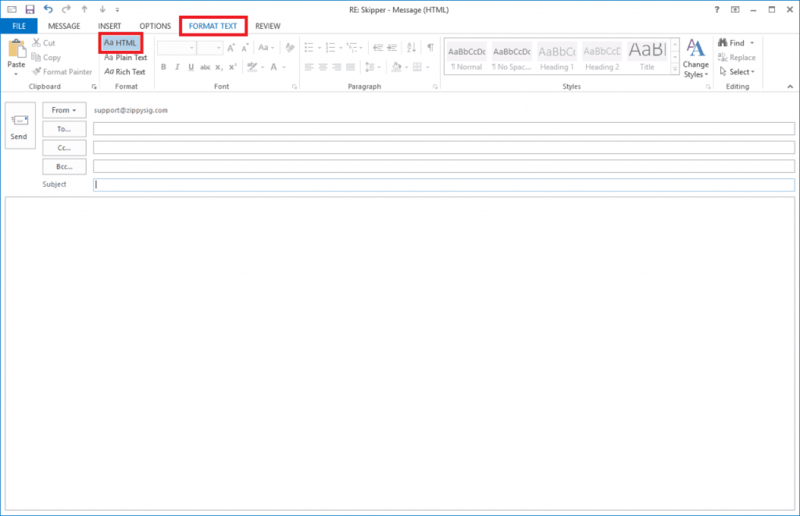 If you’ve set your composing message format to be HTML, and your emails are still being converted to plain text and the recipient definitely hasn’t converted it, then your emails are most likely being converted to plain text by your Exchange server. 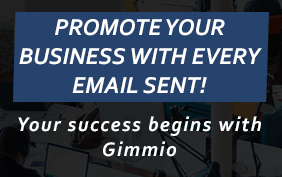 When creating your email signature, be sure to host your images on a web server and link to them from your email signature, instead of embedding them into the signature itself. If you have an embedded image in your signature, most of the time Outlook will automatically convert them to attachments. If you’ve tried everything and your email signature images are still being attached, it could be your anti-virus software (precisely the email scanning component) causing this issue. You should try disabling the feature that scans emails to see if it still happens. Sometimes figuring out why images in email signatures are converted to attachments can be an utter pain. We know because we create email signatures for a living. If you’ve tried everything above and the images are still turning to attachments, it could just be the way you have coded your email signature or maybe you’ve accidentally embedded your image instead of linking to it. We provide a free email signature generator which makes email signatures in accordance with the HTML standard specifications. When you upload an image, it will always be linked to our image hosting platform and not embedded. Creating a professional email signature means you can rest assured that at least the HTML code won’t be the reason your images are turning into attachments.